I’m so lucky to have seen this film. It has the perfect balance of history, emotion, intrigue and comedy. Oscar-winner Rachel Weisz (Denial, 2016) plays Lady Sarah Churchill, Duchess of Marlborough, a close friend and trusted ally to Queen Anne of England (Olivia Colman, The Lobster, 2015) in the early 18thcentury. Queen Anne was a real monarch of British history besotted by illness, obesity, and miscarriages, so Lady Sarah helps run the British Empire in the Queen’s stead. And Lady Sarah can always be counted on to offer the Queen a shoulder of support (and sometimes more)…until Lady Sarah’s cousin, Abigail (Emma Stone, La La Land, 2016), unexpectedly arrives looking for help. This cousin soon endears herself to Queen Anne igniting a sneaky, devious battle between the 2 women for Queen Anne’s affections. 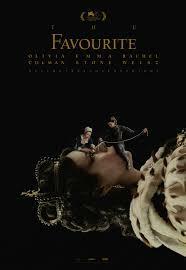 The Favourite is very much a historical drama (or period drama) with regal costumes and expansive cinematography highlighting a vast classical palace. But this film doesn’t totally feel like a historical drama because of the perfectly-written original screenplay packed with eloquent dialogue, relatably raw passion, and unpredictable jolts of humor (both awkward and shocking.) These elements of the screenplay and the controlled ferocity from all its characters help this story maintain a strong connection to contemporary audiences. The Favourite is wildly different than other popular historical dramas like Sense and Sensibility (1995) or Elizabeth (1998). Don’t expect to see much dignity or grace in these characters. The 3 main actresses give razor-sharp performances each illustrating how the winds of favoritism, and the scales of power or influence, can shift and hurt in fickle ways. This film is Oscar-bound in many categories.